You’re working hard to get or stay in shape and it can be taxing on your body. That’s why taking measures to protect yourself is important and can be the difference between achieving your goals or having to call it quits. While you’ve been working toward your goals, we had our experts research and review the best crossfit wrist wraps. Let’s see what it takes to keep your muscles strong and your wrists safe. 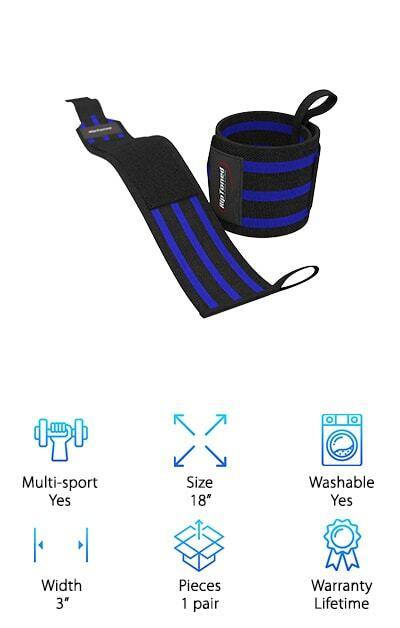 Multi-sport: Whether you’re looking for support for a specific activity or you need something versatile, this spec lets you know if the exercise wrist wraps you’re eyeing are practical for multiple sports. Size: Athletes come in different shapes and sizes and wrist wraps should, too. Let’s get you into the perfect fit! Check this spec to determine if your favorite wrist wraps come in your size. Washable: If you’re like us, you enjoy the idea of being able to wash your exercise gear quickly and effectively. We’ll let you know if your wrist wraps of choice are machine washable. Width: Depending on your sport of choice and the size of your wrists, you will be looking into different widths for your wrist wraps. This spec will tell you how wide the wraps are in inches, so you can decide if they are the right pair for you. Pieces: This spec will tell you how many pieces are necessary to complete each wrap. It’s a matter of preference, but whether you prefer a single support or a multi-wrap system, we’ve got the answers for every set. Warranty: When you’re going hard, you want something that will last. If your favorite pair of wraps has you covered with a warranty, we’ll let you know with this spec and specify the number of years it’s good for. You might be wondering what makes the best wrist wraps for crossfit. If you’re new to working out, and you don’t know where to start, don’t worry! We’ve broken each of our top ten picks into their specifications and provided information to help you make an informed decision. Seasoned crossfitters: you can breeze through this list and identify your wrap of choice with ease! Let’s get shopping! 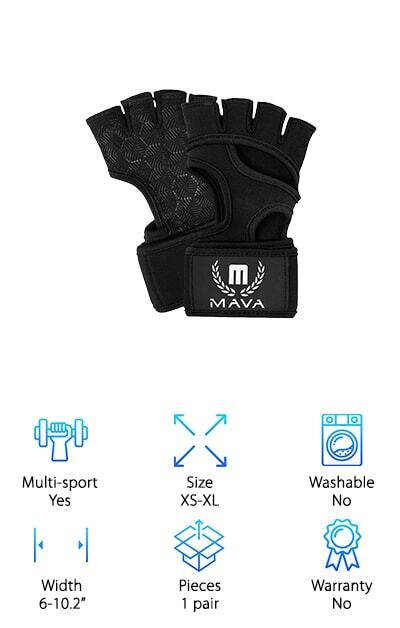 The Mava Sports gloves are our top pick and we’re not alone. When it comes to crossfit wrist wrap reviews, these awesome gloves dominate the market. Designed with their own sizing chart and available for both women and men, Mava gloves come in basic black and an additional variety of fun colors. Equipped with extra leather and silicone padding and made from neoprene for anti-sweat properties and reinforced split leather, these gloves provide excellent palm padding and protection against calluses. The palm grip is additionally reinforced with an extra silicone layer to give you the best grip possible. Specifically designed with weightlifting in mind, these gloves are also appropriate for use during rope climbing and other bodybuilding activities, including chin-ups, pull-ups, and kettlebell work. Velcro straps let you adjust the wraps for a perfect fit. Offering wearers superior comfort and functionality, it is easy to see why the Mava set comes in as our top choice! Our budget pick for best hand wraps is the Rip Toned 18” heavy-duty deluxe pair. Available in one size that can be folded over to achieve a nice fit, the wraps come in two options: stiff or medium stiff. The stiff version is great for heavy lifting with little flexibility and is preferred by most bodybuilders. The medium stiff option is perfect for added support with wrist flexibility during activities such as yoga, crossfit, and body weight training. The reinforced thumb loop design on both the stiff and medium stiff wraps keeps them in place, ultimately securing your wrists in a neutral position. Say goodbye to pain, discomfort, and injury! Easy to take on and off, these wraps provide maximum support at a great price, helping you achieve the results you’re working toward. Even better, they can be washed in the washing machine and come with a lifetime guarantee! Start maximizing your results for a minimum investment today with Rip Toned! Available in a large selection of both basic and funky colors, WOD Wear offers a fun, but practical option when it comes to crossfit wrist wraps. 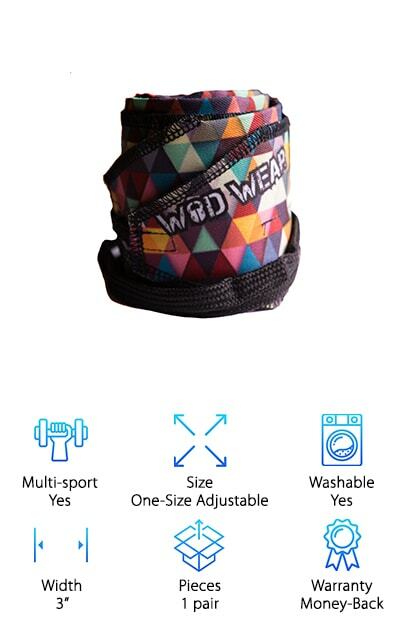 Designed to protect your wrist cartilage from overuse, WOD Wear wraps are ideal for multiple types of exercise. Enjoy maximum protection during your favorite crossfit, yoga, or gymnastics class, thanks to the ease and flexibility these wraps offer. Then switch to weightlifting or powerlifting to experience the versatility that makes WOD Wear great! These wraps provide superior protection via a double layer of heavy cotton with reinforced stitching. 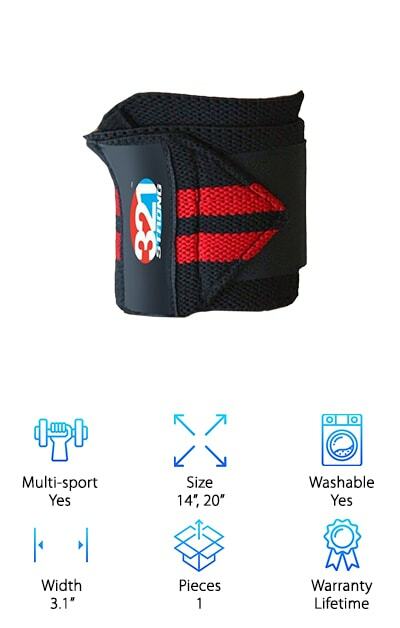 Unlike many wrist wraps, they are light and easy to adjust. In fact, a twist tight design allows for perfecting a snug fit with quick adjustments. This twist tight feature is awesome for fit folks who like to switch between types of exercises. It allows you to make a quick adjustment, instead of completely removing and replacing the wrap. If light and versatile is your thing, the WOD Wear is for you. Soft and durable, the 321 Strong Wrist Wraps provide great protection against wrist injury, while keeping you comfortable. 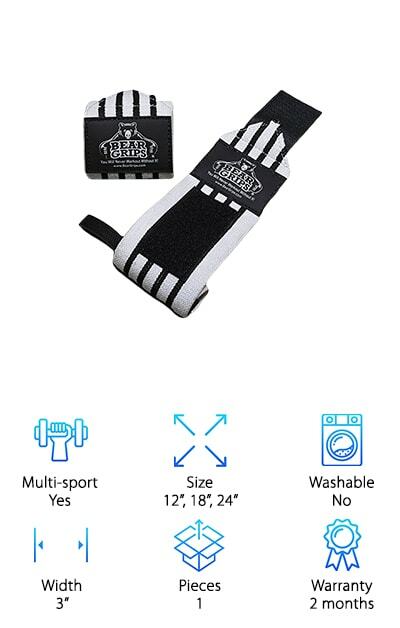 A thumb loop and Velcro design provide a snug fit that reduces fatigue and keeps your wrists in the correct position for weightlifting and exercise. Great for anyone who lifts heavy or works out hard at crossfit, 321 Strong helps you gain stability and gives you the endurance you need to meet your goals. These wraps won’t cut off circulation, but they will reduce pain or stress you’ve already experienced and prevent further discomfort. And here’s the deal: the wraps come in 14” or 20”, allowing you to pick your perfect fit. Backed by a lifetime warranty and sold with a convenient vinyl case for storage, these wraps can also be washed in the washing machine. If you’re looking for wraps with all the right features, consider yourself 321 Strong and start crushing your goals today. 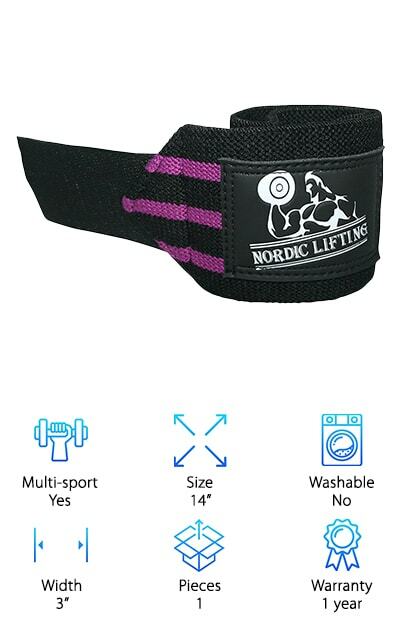 When you’re looking for the best wrist wraps for crossfit, make sure you include Nordic in your search. 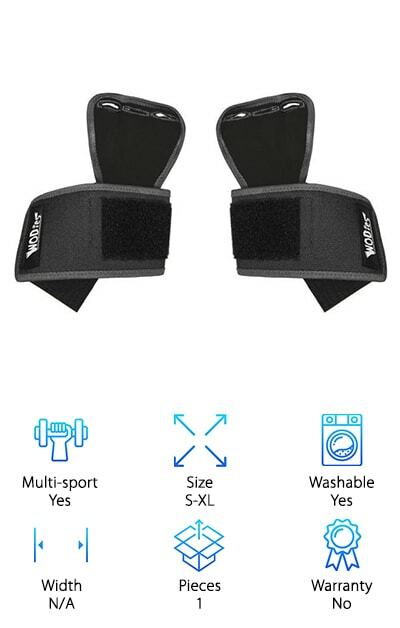 These ultra-durable wrist wraps, made with industrial strength Velcro and premium quality materials, are built to give you protection from injury and pain. Not only that, their quality means they are designed to last, so you won’t be replacing them anytime soon! Nordic fasteners are made from some of the most durable material on the market, which is evident in how their wraps perform! They provide excellent security and stability during all forms of exercise that traditionally put strain on the wrists. Perfect for weightlifting, heavy lifting, yoga, and crossfit, you can be confident that you have quality support on your side when you’re wearing Nordic wraps. Available as a one-size-fits-all for both men and women, the wraps come in several fun colors, allowing you to express your personal style while you work toward your goals. Don’t miss out on this awesome, affordable option! Style and affordability come together to bring you the ultra-durable DMoose wrist wraps. If you’re in the market for wrist wraps for training and you enjoy expressing yourself through your workout gear, then these are for you! Available in several colors and patterns, these soft, comfortable wraps are attractive and non-toxic, PVC-free, and lead-free, making them environmentally-friendly. But here’s the kicker: these stylish wraps are also top-rated and work to improve strength and durability so you can meet your goals. They provide premier support and stability via an adjustable Velcro strap that helps you achieve the perfect, snug fit. Double-stitching and heavy-duty materials keep these wraps performing and protect against wear and tear. Designed for both men and women, DMoose wraps can be purchased in both 12” and 18”, allowing you to determine the perfect fit for your wrists. 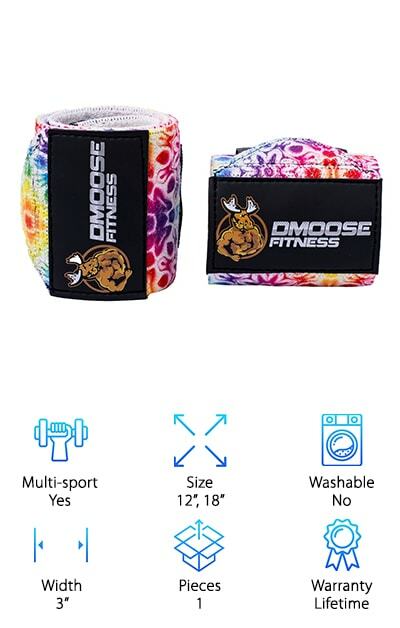 If you’re ready to enjoy bigger gains at the gym, it’s time for a set of DMoose wraps. Strong like a bear, the Bear Grips wraps are among the best wrist wraps for powerlifting. Perfect for those who lift heavy, bodybuild, or crossfit, these durable and versatile wraps provide you with superior protection. The extra-strength materials, including quad elastics and a thumb loop, keep wrist fatigue, pain, and injury away, so you can crush your goals in comfort. The real shut closure provides added security to keep the wraps from budging. That added security makes all the difference when you’re going hard. What’s more, quality meets style in this attractive striped option, available in white and black and gray and black. Men and women can choose 12”, 18”, or 24” wraps based on their hand sizes and compression preference. If you’re looking for wraps that will last and provide optimal protection, the Bear Grips deliver everything you need and then some. The Rogue Fitness Wrist Wraps offer style and strength in a variety of attractive colors and three different lengths. 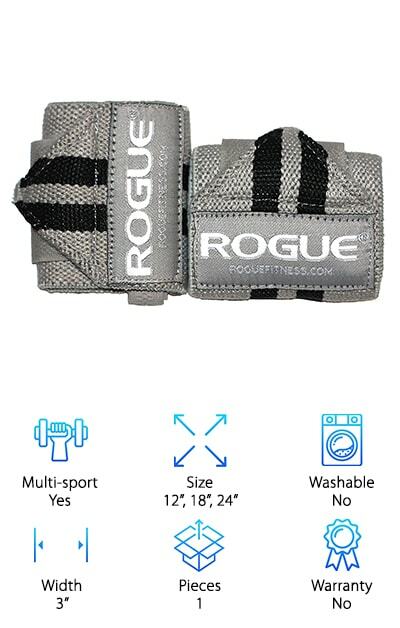 If you’re looking for crossfit wraps that provide wrist support during cross training, weightlifting, and powerlifting, then it’s worth taking a peek at Rogue. Affordable but high-quality, the Rogue wraps are designed to give a snug and comfortable fit, while absorbing moisture and keeping your wrists sturdy. The cotton, elastic, and polyester blend keeps you dry, so you can focus on making gains and pushing limits. Designed with a thumb loop and hook-and-loop closure, these wraps allow for easy adjustments and tightening. Available in 12”, 18”, and 24”, it isn’t difficult to create a custom fit to serve all your training needs. If you’re ready to get aggressive at the gym and you need the support to behind you to keep you pain-free, the Rogue wraps are just what you’re looking for. Light and comfortable, the RiparoFit Wrist Wraps are an ideal option if you need a little extra support during everyday exercise. Perfect for gymnastics, kettlebell work, and cross training, the layered, heavy-duty cotton design is reinforced with double stitching. This combination of breathable, light cotton in layers and the strong stitching gives you just the protection you need to keep wrist fatigue and pain away and prevent injury. Best of all, these wraps are convenient and easy to adjust or tighten during your workout. 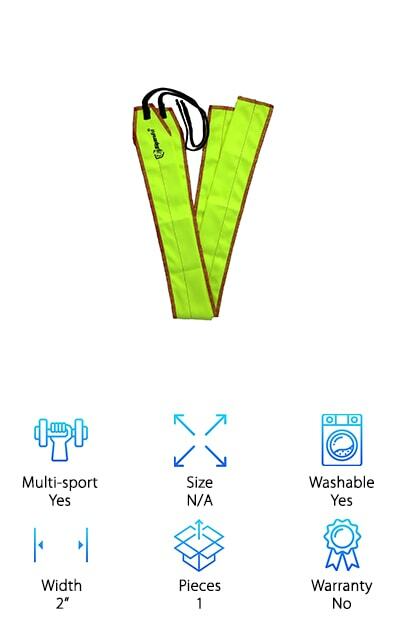 Instead of having to stop and remove your wrist wraps completely, the quick adjustment feature keeps you going where it really counts: on the floor. Available in a wide range of colors and patterns, the RiparoFit allows you to express yourself while you’re crushing your fitness goals. This unisex pair of wraps is available as one-size-fits-all. Make RiparoFit your choice today and start experiencing the joy of comfortable, pain-free workouts. Jerkfit wrist wraps are more than just wrist support. This amazing set of wraps also provides palm protection, so when you’re lifting heavy or doing serious cross training, you can keep your mitts safe and soft. Available to both women and men in a range of sizes from small to extra large and a variety of fun colors, these top-rated wraps provide stylish, superior protection to your hands and wrists. If you’ve been experiencing wrist pain or simply want to avoid it altogether, the Jerkfit design offers the relief and comfort you seek. Equipped with a natural glide that absorbs friction, you can feel good knowing your wraps will never pinch your hands. The high-quality materials, snug, adjustable fit, and padded palm protectors give you all the support you need while focusing on your fitness goals. Additionally, the durable material absorbs chalk and sweat, so you can enjoy an extra grip! One last thing, hand-made in the USA, the elastic material is hypoallergenic, so if you have sensitive skin and you need wrist wraps, look no further!